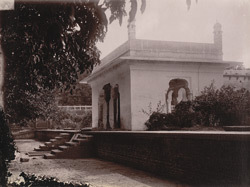 Photograph of buildings under repair in the Shalimar Gardens, Lahore taken by Henry Cole in 1884 as part of the Archaeological Survey of India Collections (Indian Museum Series). The Shalimar Gardens were constructed by Ali Mardan Khan on the orders of the Mughal Emperor Shah Jahan in 1637. The white marble pavilion is one of several in the gardens and is typical of the style of Shah Jahan.